Saley the Dogo Argentino at 17 months old—"I apply Cesar Milan's advice and Saley is one of the best behaved dogs in the city (although the breed is very, very stubborn. Like a bad kid in puberty. :). Btw. I am a first time owner and you CAN have an "advanced" breed, but you need dedication and to really establish the alpha / pack leader position. Once you have that, it doesn't matter if you work with a Poodle or a Mastiff, you just need to be consistent. Either way, for an average American, this dog could be too much." 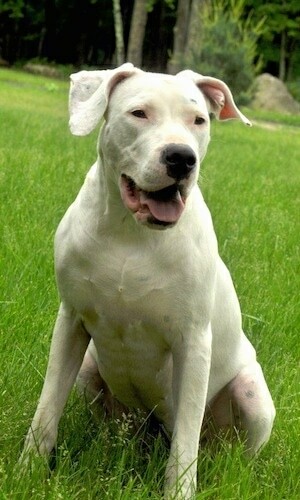 The Dogo Argentino is also called the Argentinian Mastiff or Argentine Dogo. It is a large, well-muscled dog. The deep-set chest is wide. There is an abundance of skin on the muscular neck. The head is massive with a rounded shape from front to the back. The muzzle concaves upwards slightly, with a slight stop and is about the same length as the skull. The jaws are strong. The teeth should meet in a scissors bite. The nose is black. The eyes are set well apart, and are dark brown, light brown or hazel in color. The rims of the eyes should be pink or black. The ears are set high and are usually cropped to make them stand erect, and triangular in shape. The thighs are very muscular with a short hock. There are usually no dewclaws. The thick tail is long and carried naturally low reaching the hock. The thick, glossy coat is white and has no undercoat. 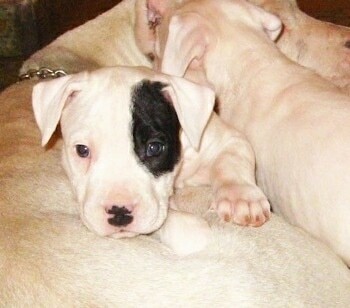 While not accepted in all clubs, sometimes the Dogo Argentino can have a black spot on the head known as "pirata." This trait in the Dogo´s coat is accepted by Federacion Cinologica Argentina. The Argentine Dogo is a loyal dog who makes a great guardian of the home and family. Playful and very good with children, it gives kisses and cuddles. Highly intelligent and powerful, Dogos are easy to train if you are consistent, using loving but firm authority. 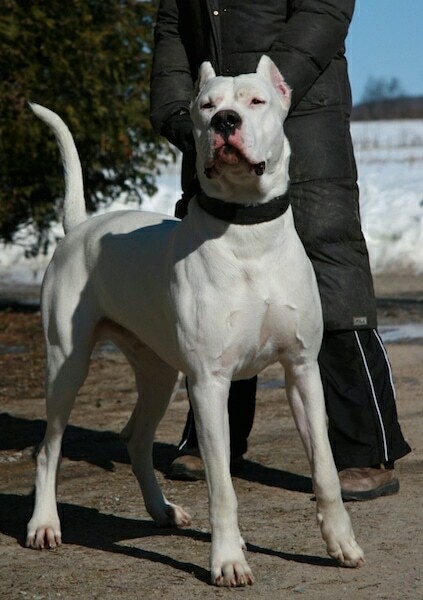 The Argentine Dogo is not a breed for everyone. With the right owners even the more dominant Dogos can be submissive toward all humans and other animals. This breed needs someone who understands how to display leadership: humans who are firm, confident, and consistent. This breed needs rules he must follow and limits to what he is and is not allowed to do. The objective in training this dog is to achieve pack leader status. It is a natural instinct for a dog to have an order in its pack. When we humans live with dogs, we become their pack. The entire pack cooperates under a single leader. Lines are clearly defined. You and all other humans MUST be higher up in the order than the dog. That is the only way your relationship can be a success. When you put this breed with a meek or passive owner, problems may arise as the dog will feel he needs to "save his pack" and run the show. Adult Dogos can be aggressive with other dogs; however, the Dogo does not usually provoke the confrontation but may if he senses another dog that is unstable. 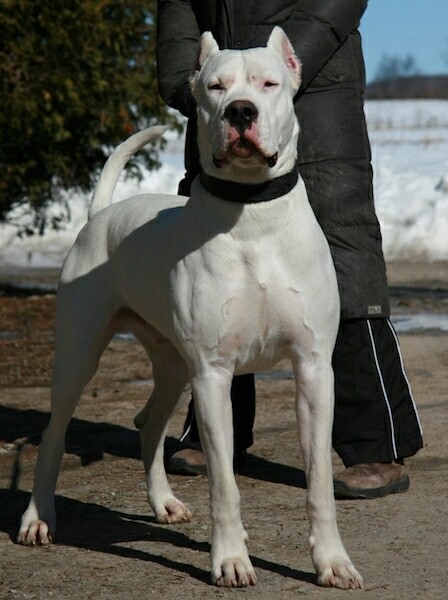 The breed needs an owner who can tell the Dogo it is not his job to put another dog in his place. They are good with other pets if they are raised with them from puppyhood. 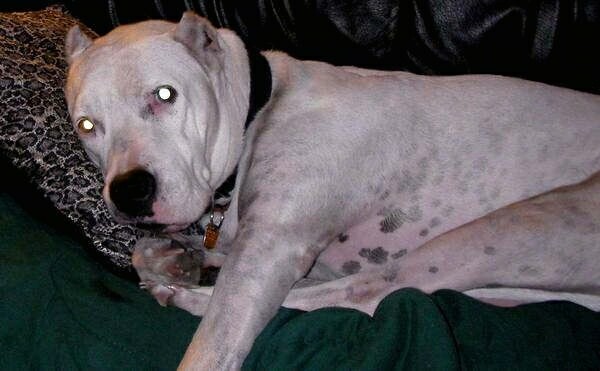 This white mastiff needs early socialization with other animals. It also requires early obedience training. In the 1920s the Argentine Dogo was developed in Argentina by Dr. Antonio Nores Martinez and his brother Agustin. The brothers wanted an ideal companion dog that was also a good pack hunter and guardian. The breeds that were used in the development were the Great Pyrenees, Irish Wolfhound, Pointer, Great Dane, Dogue de Bordeaux, Boxer, Spanish Mastiff, Bulldog, Bull Terrier and a now extinct mastiff-type breed called the Dog of Cordoba. The result was a bullish, fearless hunter who also had great stamina. The white coat deflected the heat rather than absorbed it. Unfortunately the breed earned a bad reputation in Britain when people started using the dogs for dog fighting, which is an activity still popular in many parts of South America and elsewhere. Rather than go after the dog fighters, Britain has enacted a national legislation to control dogs in public. The Dangerous Dogs Act which came about in 1991 totally bans the three breeds Fila Brazileiro, Dogo Argentino and Japanese Tosa. A fourth breed, the American Pit Bull Terrier, is allowed but is heavily restricted. The dogs must be registered, neutered, tattooed, microchipped and owners have to carry insurance. The dogs cannot be bred or imported and when in public they must be muzzled, leashed and handled by a person over 16 years of age at all times. This is a real shame. When properly raised these are all great dogs. A dog is what the master makes of it. Not all breeds are for everyone. People teach these dogs to fight, giving them a bad name. Banning the breed is not the way to solve the problem. Some of the Argentine Dogo's talents are hunting, tracking, watchdog, guarding, police work, narcotics detection, military work, guide for the blind, competitive obedience and Schutzhund. 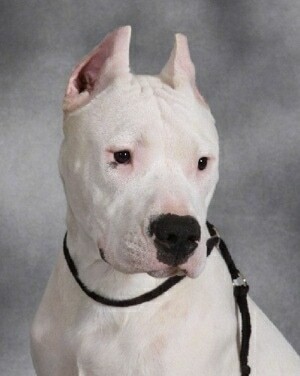 Rocky the Dogo Argentino at 2 years old weighing 125 lbs.—"When I received him from Argentina he was sick and bony. The breeder did not deworm him and he pooped blood with moving worms and he almost died. I had to send him to get emergency treatment. Since he was so sick and weak during his puppyhood I never expected anything much from him. I tried my best to provide him the best life possible... and one day, I just could not believe how big, strong and handsome he had become. He has an excellent temperament is great with people, loves kids and gets along well with our cat just fine. He goes to work with my wife every day. Everybody at her work place just loves him. He is very energetic. I take him jogging everyday after work. He is obedience trained, so I can let him run off leash. This way he can run around to get more exercise." 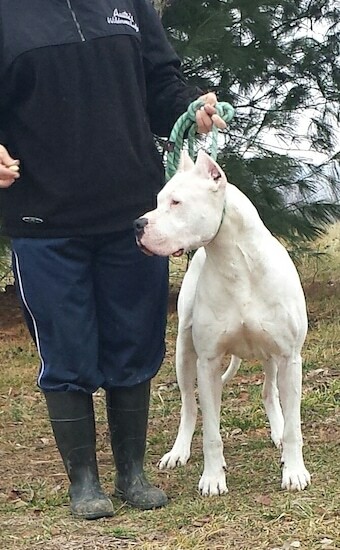 Rocky the Dogo Argentino at 2 years old weighing 125 lbs. 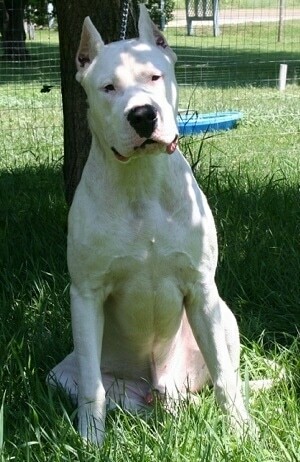 This is Saley the Dogo Argentino at 17 months old. She is an example of a Dogo with natural ears. Her ears are not cropped. "I am an avid Cesar Millan fan and although I recently discovered him on TV, I have used similar training methods and techniques with all my dogs throughout my life. We have wonderful balanced energy, which keeps everyone safe and happy and healthy :) This is "Gone to the Dogos Kilo" at 8 months old just chilling out at home in the backyard." "Here is an updated picture of Grand Champion Gone to the Dogos Kilo (nearly 8 years later)! He is a wonderful, beautiful dog and is turning 9 years old now! He is a multiple Best in Show winner and we are very proud of all of his accomplishments!" 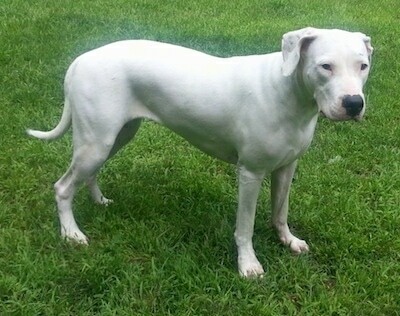 "Donna Auca Liu, my female Dogo Argentino dog. Sometimes Dogo Argentinos can have a black spot on the head that are known as "pirata" (a trait in the Dogo's coat accepted by Federacion Cinologica Argentina). Donna is loving and loyal. She likes food which is good, because she is learning tricks very quickly, and the reward is a few pellets of Royal Canin Maxi - Junior. The only thing she does not eat is green leaves salads and citrus. She walks beside you: you can even take her out on a bike or roller skates and she'll go at the same pace. She doesn't bark as other dogs do (only when someone unfamiliar is too close to the house—when the subject is gone, she stops barking)." 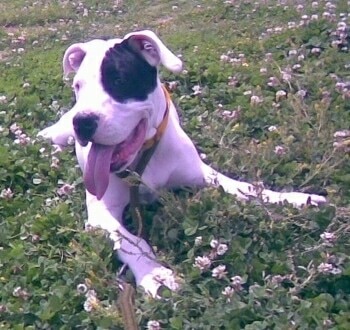 "Donna Auca Liu, my female pirata Dogo Argentino dog as a 37-day-old puppy. Dogos with a black spot on their heads are called "piratas."" "Here are three of our debonair ladies Bella, Zoe and Lucero. 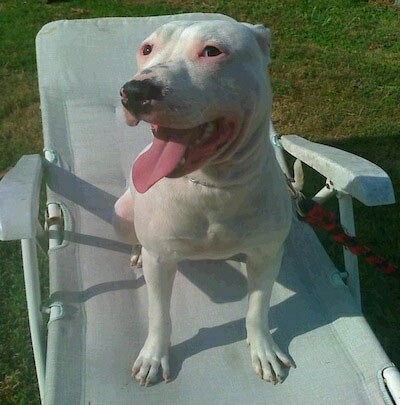 Dogo Argentinos love to lounge in the sun but since they are an all-white breed they can get a sunburn and care must be taken, especially in the hot summer months. Sunscreen may be used to protect their pink skin from getting a sunburn and they should also have access to shady areas as well." "Gone to the Dogos Facon at 7 months old, taken by Lankford photography after his first Best of Breed win!" 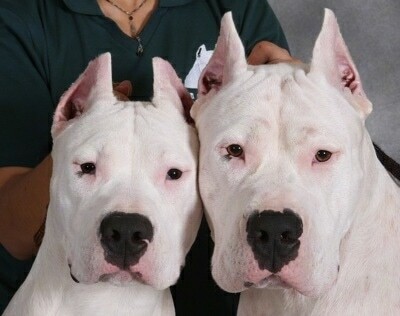 "Kilo at 10 months and Facon at 7 months, after they took back-to-back Best of Breed wins." Taylor the Dogo at 6 years old—"He is a very well-trained dog and he loves people." Maverick the Dogo at 1 year old—"I got my puppy Maverick at six months old. His original owner told me he wasn't going to make it. He was the runt out of a litter of 13 and didn't get the nutrition that he needed. He was thin and very weak, but three-hour feedings and a lot of vet visits he made it through to be a happy, healthy dog that loves his buddy Gator (a Chiweenie). He also gets along with all dogs, big or small and loves cats and chickens as well. He never shows aggression." I Rescued Tiva from hunters who paid a lot of money to have her hunt wild boar and sometimes jaguar. She was given to me at 7 months old because she did not have a mean bone in her huge body. Needless to say the original owners were very upset with her and I was able to rescue the dog before they had her put under. This dog has been sent by angels to me. I am 33 years old and haved now owned the dog for almost 12 years. I was in a horrible car accident that left me paralyzed from my chest down. Tiva has made a very WONDERFULL pet but here in my household she is considered a member of our family.